The voting was super close, but by a slim margin the warrior Nakir Death-Angel has won out over Shen Dark-eyes the rogue as our intrepid committee-led adventurer in the Fabled Lands. If he should come to an untimely demise (which, from my limited testing, is a distinct possibility), we'll try again with Shen. For now, onward to adventure! Before we begin, though, I thought you might need to get a closer look at Nakir. No curses, blessings, resurrection arrangements, titles, god, or honors. Many a man who has mistaken your good looks and manners for foppishness has ended his life in a spreading pool of blood. Yet still you wish to perfect your skills so that no one can stand against you. You have heard that a general in the Court of Hidden Faces needs the services of a good warrior. You are alone in an open boat waiting for death. How your life has changed since that day when you set out from your homeland across the Cragdrift Sea. You had signed on board a ship with the hope of visiting a dozen ports and seeing a thousand wonders. But calamity overtook your voyage in the first week, when pirates swooped down upon the vessel. You and a handful of shipmates managed to get the cutter down into the water and were making off, but some of the pirates leapt down from the rail right in your midst. The fighting was hard. You remember little of it now, but when it was over the boat was awash with blood and you were the only one left alive. Of your own ship and the pirates' craft there was no sign – the current had carried you out of sight of any living thing. Best not to think how you've survived since then. At the mercy of the wind and sea currents, you have been swept steadily westwards into regions completely unknown to you. Drinking-water has been your biggest problem – you've had to rely on rain, and there has been none for days. Your body is weak, your spirits low. Then, just as death seems ready to draw his boat alongside, you see something that kindles new hope: white clouds; birds turning high above; the grey hump of land on the horizon! Steering towards the shore, you feel the cutter lurch as it enters rough water. The wind whips up plumes of spindrift and breakers pound the cliffs. The tiller is yanked out of your hands. The little boat is spun around, out of control, and goes plunging towards the coast. You leap clear at the last second. There is the snap of timber, the roaring crescendo of the waves – and then silence as you go under. Striking out wildly, you try to swim clear, then suddenly a wave catches you and flings you contemptuously up on to the beach. You are battered, bedraggled, but alive. 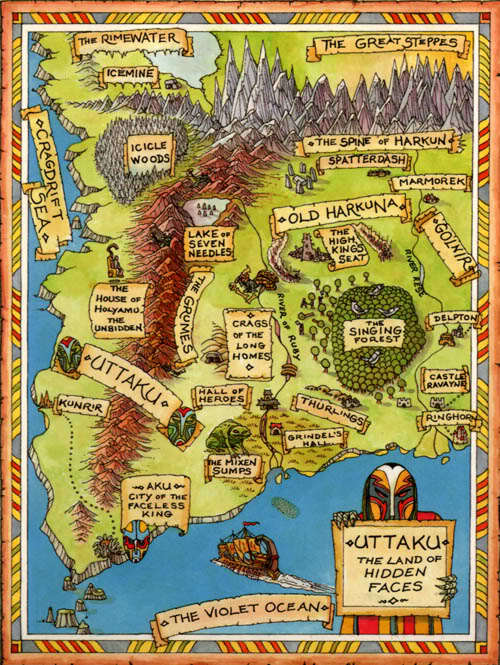 You are traveling in Old Harkuna, just west of the River Rese delta. A castle stands on a low hill close by. This entry was posted in Adventures in the Fable Lands. Bookmark the permalink. How about he goes on a journey to find a better name? I know Right? cant he get something more normal, like Joe? Hey man, he’s got DEATH right there in the name! DEATH, man!! Yep Hak, just started this yesterday. It might fall flat but I figured I’d give it a whirl. Basically doing one of those “Choose Your Own Adventure” / “Fighting Fantasy” type eBooks with the HM community voting on choices. I think we can rename him, I’m not married to it by any means. Suggest away! Maybe Nakir Pouchheavy Deathface Bloodcrusher? How about just “Rob” and cut to the chase? How about “Thanos” its greek for death just not as flat as “Death” and Seraphim is latin for Angel. So, why not call him “Naakir Thanos Seraphim” sounds better with the same meaning! Well, that’s my rambling about names. “Nakir Thanos Seraphim” I added another A by mistake on last post. Oh, come on! Death-Angel rocks! It’s clearly ‘Nakir’ that’s the problem. How about…Grimdark Death-Angel. But his friends could call him George.